The record is made up of 1 volume (102 folios). It was created in 1904?-1905?. It was written in English and French. The original is part of the British Library: India Office The department of the British Government to which the Government of India reported between 1858 and 1947. The successor to the Court of Directors. Records and Private Papers. Inclosure 4 in No. 1. Sir A. Hardinge, to M. Laronce. g- r Zanzibar, June 10, 1898.
the protest contained in it in the matter of Salim-bin-Seif. the point of view of the rules of international courtesy. A Pemba Arab, to all appearance a local subject, is arrested for an act oi slave irade. particular person as a subject or protdge of Germany. • • jv . ■■ J ■' 1 1 i as local subjects. WliU, tUAJUgUL -a- ' r - ' _ ' _ .
J J I have, &c.
Inclosure 5 in No. 1. M. Laronce to Brigadier-General Raikes. assez etonne d'une maniere de voir tout a fait opposee aujourd'hui. 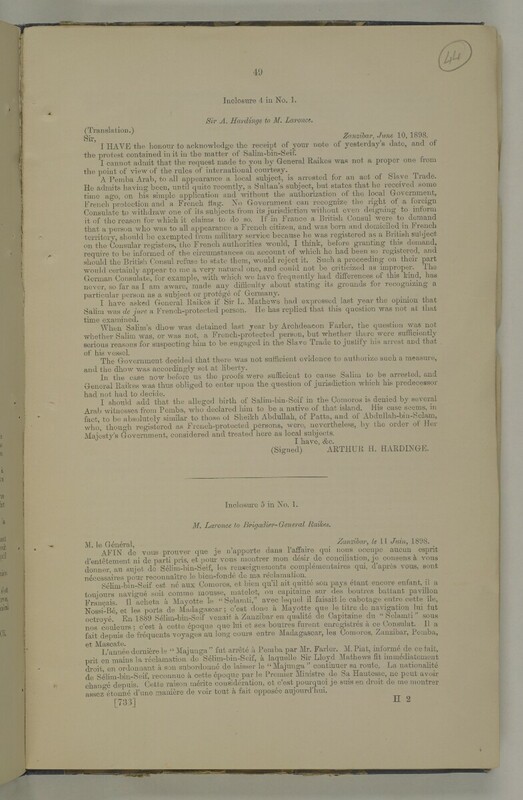 A printed report in 1904 by the Office of the Superintendent of Government Printing, India, relating to the arbitration on the issue of French flags to Omani dhows. An agreement between Britain and France in 1862 committed both governments to respect the independence of the Sultan of Muscat. Reply on behalf of the Government of His Britannic Majesty to the Supplementary Conclusions, presented on behalf of the Government of the French Republic and admitted by the tribunal on July 25, 1905. The verdict (in French) of the arbitration tribunal. Treaty Series (No. 3, 1905) - Agreements between the United Kingdom and France referring to arbitration the question of the grant of the French flag to Muscat Dhows. The section on the geography of Oman (ff 58-59A) discusses the French claim with reference to Kiepert's map of 1850. Includes a sketch map of the Persian Gulf Historically used by the British to refer to the sea area between the Arabian Peninsula and Iran. Often referred to as The Gulf or the Arabian Gulf. and Arabian Coast (folio 91A). Description: The foliation sequence commences at the title page and terminates at the last folio; these numbers are written in pencil, are circled, and are located in the top right corner of the recto The front of a sheet of paper or leaf, often abbreviated to 'r'. side of each folio. Foliation errors: 1, and 1A; 50, and 50A; 59, and 59A; 84, and 84A-C; 88, and 88A; 91, and 91A. Pagination: A number of original typed pagination sequences are also located in the file.